We have a team of designers at VPN Marketing Group who work with our programmers to create completed sites. Our programmers write all of our code. In this way, we can offer lower cost solutions for functionality that businesses need to streamline some of their processes. This also means that we can adapt our code as needed to fit a specific client's needs. 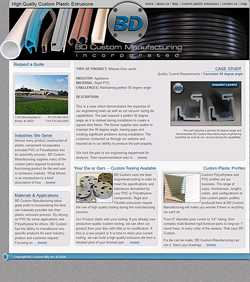 BD Custom Manufacturing had lost their domain and called us to help them get it back. Once we had secured it, they asked if we could bid a site redesign. They are a custom plastics extrusions company and were beginning to expand and branch out into new markets. While they didn't need to sell online, they did need to show their capabilities and commitment to their customers and to quality. They also needed to accept quotes and drawings from their online form. Dan's Service Center needed to display their products; and, they felt they may want to offer some items for online sales in the future; just not in the immediate. Rather than building a photo gallery for the short-term and, then requiring them to move their data to a shopping cart later; we adapted our shopping cart codeto meet Dan's needs. Now, all items display in an organized shopping cart structure; and, if Dan's wants to offer an item for sale, they can simply turn on the shopping cart features (add to cart, checkout, etc.) with the click of a button when they are ready to try online sales. Unlike many in our industry, every member of the VPN Marketing Group staff is not only computer literate but, highly competent. While we may specialize in writing or graphics or scripting; in planning or project implementation, we are all proficient in a myriad of general and proprietary software packages, networking configurations, and web-related computer applications. 1) When we design websites, we plan for our client's end-users and staff, taking into consideration skill levels, age, and aptitudes. If a client would be best served by having a site that a secretary or intern can keep updated, we create tools that accomodate minimal skill levels with little or no training. 2) Our marketing efforts are customized to our client's current status, vision and budget. We find creative ways to stretch advertising dollars; providing easy to use web-based tools should a client desire to participate in self-promotion. Our goal is to empower clients, not capture them.